I’m home. Everything changed while I was gone, and the differences are breathtaking. Being gone only 8 days and having the landscape so different really gives me an appreciation of how fast the seasons pass. Of course, we didn’t really get a spring this year, just several months of really crappy weather. So it’s like the last few weeks of spring and the first few weeks of summer compressed in on each other. We’re eating lettuce, radishes, spinach, and chard from the garden. But most of the hot weather plants look like they’ve gone south, so we’re planting some backup tomatoes and corn. The fruit trees look great, most of them loaded. But the brassicas (cabbage and the like generally planted very early) are depressing. Some of the cabbage and all of the broccoli just got to about 8 inches high and bolted. Total loss. 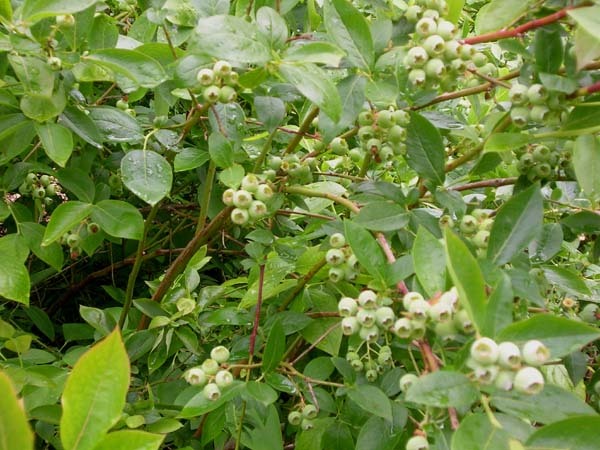 The berries are at least a month late. But the Japanese irises and foxglove are blooming like crazy, the grass is that soft spring green and smells fresh, and the trees are fully leafed out so that the light filters through them in that wonderful summer way. The convention was fun. I got 5 top-ten finishes in the 39 categories of poem that I entered, so I’m happy. If that doesn’t sound too impressive, you should know that most categories had from 200 to 300 poems entered. Now I truly must go move some sprinklers. No deep thoughts today, just gratitude for a return to the NW. Much as I enjoyed the convention and the different landscape, there’s no place like home. I’m getting darned tired of this stupid weather. Spring officially arrived a week ago, and the next day I planted most of my early garden–brassicas, lettuce starts, green onions, snow peas, sunflowers, a few potatoes (the rest have to wait until we can till the bed again). I also planted another dahlia and four lilies. Every day since then, it has rained, hailed, snowed, and otherwise generally misbehaved. If this is leading up to an April Fool’s Day blizzard, I am going to be really pissed. I checked the starts yesterday and they looked fine. I’m afraid to go back and look again after a morning of snow and hail and a full afternoon of monster hail storms. So I’m ignoring things, at least for the moment. A chicken carcass is simmering on the stove. I roasted a chicken tonight, made mashed potatoes, stuffing, and gravy, and as we were stuffing our faces Ben looked over and said, “That chicken cries out to be made into soup.” And I started visualizing chicken and dumplings. After a week of crappy weather I am really tired of feeding fires, but I told Ben if he’d feed the stove so I could do something else, I’d cook the chicken down and make something wonderful. He agreed, and before too long I’ll be able to set it off to cool and deal with it tomorrow. I met all the poetry contest deadlines only to discover some other writing challenges. I’m working on a Malayan pantoum at the moment about a funeral. The pantoum lends itself wonderfully to ritual, and I suppose that’s what’s on my mind now. A week from tomorrow is Tom’s wake, and I’m running out of energy to deal with the emotions (other people’s, not my own–I’m just tired) that are surfacing around that. So that’s what’s going on here tonight. Even the hummingbirds have been fighting all day. 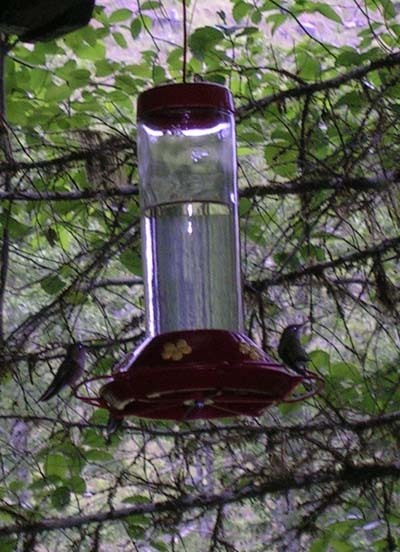 But I did re-engineer my feeder today and it works much better. It was prone to developing an airlock, and you had to go up every so often and give it a good whack. But as I was refilling it today, I found a spot that was obviously supposed to have a little air hole but hadn’t been punched all the way through. So I got a push pin and fixed it. Now it works great. I’m quite smug about that little piece of problem solving. But I’m still going to be grumpy until I get some sunshine for more than 10 minutes at a time. . .
Nathan Zeldes leading the charge to sanity? Well, I finally got around to the Sunday NYT today (except for the book review and the magazine, which I’ll take with me to Tom’s tomorrow). There’s a great little essay by a man who’s forcing himself to become unwired one day a week. It’s an interesting piece overall, but I got a chuckle to discover one of my Intel buddies, Nathan Zeldes (full disclosure: our acquaintance is an online one, since he’s half a world from me), quoted regarding his efforts at Intel to reduce e-mail. For those of you who haven’t made Nathan’s acquaintance, you’ll find his Web site linked in my blog roll. When I first moved out here, I suffered a bit from technology withdrawal. I had gotten used to being online all the time. Not being able to do that made me a little uncomfortable. I’m off to Tom’s again for a couple of days tomorrow. I don’t even take my laptop with me any more. We have so little time left to share that I want to just be there, even when he’s sleeping. On the Big Elk front, spring is definitely early. The daffodils are blooming right on time, but the first hummingbird showed up three weeks early, buzzed me, sat down and folded his wings and said, “Where’s the feeder?” It was up the next morning, and he found it within an hour of daylight. I remember this hummingbird from last year. He’s a bit of an odd duck. He’s a rufus, but he seems to not know how to hide his bright ruby-colored gorgette the way most of them do. He flies around glowing all the time. Since to other hummingbirds this is a “fight” challenge, things are interesting when he’s around. He also makes a sort of odd metallic sound when he’s buzzing around. At any rate, there’s no mistaking him, and I’m glad to see him back, even if I wasn’t quite ready to deal with the feeder yet. Now the pot roast needs attention, and I will ride off into the night. Not only the snowdrops but the daffodils are poking their little shoots up through ground very nearly still frozen. Spring will be early this year. But the really good news is that the pesky giant mole is dead and I can go on to worry about other things in Wii-world. Josh’s advice helped, but I really had to pay attention to when to thump-jump. My brain was somewhat foggy on the matter. I’m still not totally sure why he finally died, but nonetheless, he did. It’s hard to come back to real life, but back I am. Tonight’s dinner is my Americanized version of wonton soup. Everything’s done except the last-minute stuff. The last of the crystallized ginger scones from yesterday are sitting on the counter, and I’ll probably reheat them for dessert. Our concerns are obviously different, but she’s still one of my favorite folks. As I told her once, if she wasn’t my daughter, I still have to choose her for a friend. Now to go boil stuff. . . I have no creativity at the moment, so here’s a quick update on the state of things around here. I’ve tried and tried (without much success) to get a few good pictures of the hummingbirds. But when the light is right, I don’t have the camera, and blah, blah, blah. But maybe these will give you some idea of the crowd around the back deck. 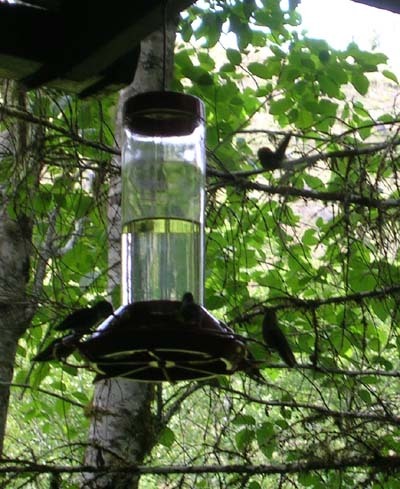 If you look carefully, you can count 7 (two of them tails only) on the feeder with one waiting in the wings. You can’t see the other 9-10 that are diving around in the trees. I’ve been eating a few raspberries and strawberries. These won’t be too long. They’re the earliest of my six varieties. Cabbage, cauliflower, broccoli, spinach, radishes, onions, bush green beans, baby and mature lettuce, a few tomato plants, some herbs(cilantro and dill), and the strawberry bed in the background. 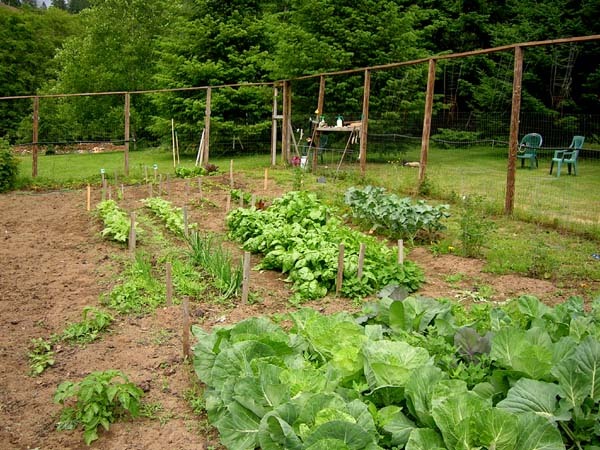 Below the fold, so to speak, off to my left, are corn, squash(four kinds), melons, cucumbers, more tomatoes, some volunteer potatoes, hot peppers, green peppers, eggplant, artichokes, and rhubarb. The bare spot on the left is a road to get the mowers or the RTV in and out. There are also a few scattered flowers–roses, dahlias, zinnias, and snapdragons. Those are for the soul rather than the stomach. I know a couple of you have written and I haven’t responded. I promise to do so shortly. But tonight I’m really, really tired, and I don’t have the energy to go figure out who I have and haven’t answered. But something interesting happened today. This morning I cranked out a biography, publishing credits and table of contents for a poetry manuscript of some 70+ pages. Then I drove to the post office to make sure it got postmarked within the competition deadline. I chatted briefly with the nice woman behind the counter of my small local post office, explaining my concerns about the postmark. She told me how she would ensure that it was readable, and blah, blah, blah. Then she looked at the address and said, “Oh, you’re a writer?” I admitted I was guilty as charged. Some years ago, a friend of mine who writes really terrible poetry (I can say that because I know she’ll never see this) said, “Well, you may be an author because you have a published book, but you’re a writer because you write.” I thought that was an interesting distinction. And true. I hope I made some appropriate remark to the post office lady, but to tell you the truth, I was so taken aback by her enthusiasm that I have no idea what I said. But I do think that I’ll keep going to the little post office to mail my stuff in the future. I want to share her excitement in my poor publishing efforts. At any rate, the manuscript, as they say, is in the mail, with an appropriate postmark. I have let the universe know that I’d really like to win this competition, and in about 10 weeks I should know how well the universe listened. Maybe it’s like the old saw: God answers every prayer; you just may not like the answer. There’s much more to say, about berries and gardens and birds and far more important things than poetry manuscripts, but it will have to wait for another day. I think my manuscript might actually come together. Today I printed out a lot of poems and loosely organized them. I wasn’t happy with the title I used previously, but I’ve settled on a new one, thanks to Mike Green, my previous director at Intel. Mike’s a writer also, and when he said, “I wish I’d written that,” I listened. But I found another reason why I’m still married (and remarkably happily so) after all of these years. Ben has surprised me from time to time in what he reads. I subscribe to a number of relatively weird (or at least esoteric) publications. One of the ones that Ben reads regularly is The New York Review of Books. Not what I would have chosen for him to read, but I’m glad he likes it as much as I do. Reading this weekly gives you a taste of reading much more widely and a hint as to where you might read more deeply. That’s where I discovered E. B. White’s collected letters, for example, a book that almost instantly catapulted to my list of all-time favorites. He brought the magazine out to where I was puttering around. I didn’t have my reading glasses, but between the two of us and his spelling efforts, we determined that the word in question was “misogynist.” “Do you know what that means?” He asked. I told him it was a word that describes someone who hates women. “That would be a very hard word to use in a sentence,” he said, and I fell in love all over again. Ben is definitely not a man who could comprehend hating women. . . 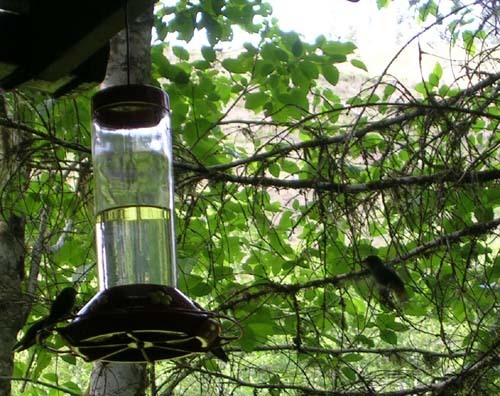 The hummingbirds are eating me out of house and home. I had to buy ten more pounds of sugar yesterday (just got ten a week or so ago). But they are consuming about two quarts of syrup daily. Our count is up to about 20 at feeding-frenzy times, early morning and late evening. I’ve seen 10 sitting on the 6-hole feeder numerous times. They’ve learned to share holes so more can feed at the same time. We’ve had two days of fairly heavy rain. But the Rose Festival parade was this weekend, so it should clear up any time now. Ralph made enchiladas (with close supervision) tonight. He’s pretty well mastered the art of corned beef, so this expands his repertoire. They were very good, topped with “the whole Marianne,” a salad of lettuce and tomatoes and olives, and accompanied by guacamole, sour cream, and salsa. It’s 9:30 and still basically daylight outside. I love this time of year. By the time I get everything shut down, it will probably be dark. And so to bed. My blogging friend Ombusben posted a wonderful entry about “Mocking the Mockingbirds.” I took me back in space and time to at least two different occasions. If there is something I really miss in western Oregon, it’s mockingbirds. I guess we just don’t have quite enough heat for them to enjoy living here. Or maybe they’re just too lazy to commute for such a short warm time. Several decades ago, I lived in northern Marin County in California. I loved the house, including the 40′ swimming pool in the back yard. The story I want to tell you began there. At the time, I was 8+ months pregnant (a situation that continued for about 6 weeks–my daughter is still chronically late) and very uncomfortable most of the time. I awoke very early in the morning unable to sleep, and I would slip outside and lie in a deck chair by the pool. In a corner of the yard was a huge Monterey pine, the tallest tree in the neighborhood. Those of you who know mockingbirds will understand that this characteristic makes it a mockingbird magnet. Each morning a mockingbird (the same one, I’m sure) would come and sit on the very tallest branch and sing to me for hours. He had a huge repertory of bird calls. It’s hard to remember being happier, even as uncomfortable as I was. When my daughter was 13, I had been living in Oregon for nearly a decade (again–I was born and grew up here). We bought a wonderful old house that had been horribly abused. But it was a terrific house on a huge lot about 5 minutes from downtown, and we loved it. I was out slogging in one of the flower beds one morning not too long after we moved in. The yard, if possible, had been even more abused than the house, but we were determined to get it back. Three days later, I was still weeding in the same area. I began to hear beautiful bird song, at least a half dozen different species. I started looking for the birds, and here’s what I found: In the top of the spruce tree was a mockingbird. He sang for me as I worked for several days. Then he was gone. He never came back. I’ve often wondered how far he had to come that it took three days to get there. I also wondered how he could have heard my call/wish from wherever he was. But I will never forget him. If you ever want to try to interest a small child in gardening, start with radishes. This is an instant gratification crop in so many ways. You plant the seed, water, and just a few days later, up pop the first leaves. And they’re not these puny little nearly invisible seedling leaves, either, but good-sized heart-shaped leaves that children love and can identify easily. Then just a couple of weeks and you’re eating radishes. We had the first salad from the garden last night (everything except the tomato–still a little early for those here). But I had three varieties of lettice, baby spinach from the thinnings, and very nice bright globe radishes. My icicle ones are almost ready, could be picked now, but I’d rather give them a few more days. At any rate, tossed with a very nice champagne vinaigrette dressing, the whole thing tasted like spring and was a great complement to our left-over spaghetti (always better the second day). Now I’m off to a birthday party for one of my favorite seniors (even more senior than I am. . .) bearing pasta salad, deviled eggs, and a bottle of nice pinot grigio for the potluck/barbecue and a potted plant for “Grandma,” as she’s known in the valley. Some pictures for Jenny of spring in the Pacific NW part of the U.S. But the rest of you might enjoy them, too. Between the garden, houseguests, and trying to get my manuscript together, I’m in overload and don’t have the concentration to write something creative here. So here are a few pictures instead. Today I counted 12 at one time, but it’s rather difficult to get a reasonably focused picture when they’re all buzzing around. And the feeder is in the shade most of the time, so you can’t see the irridescence of their feathers. 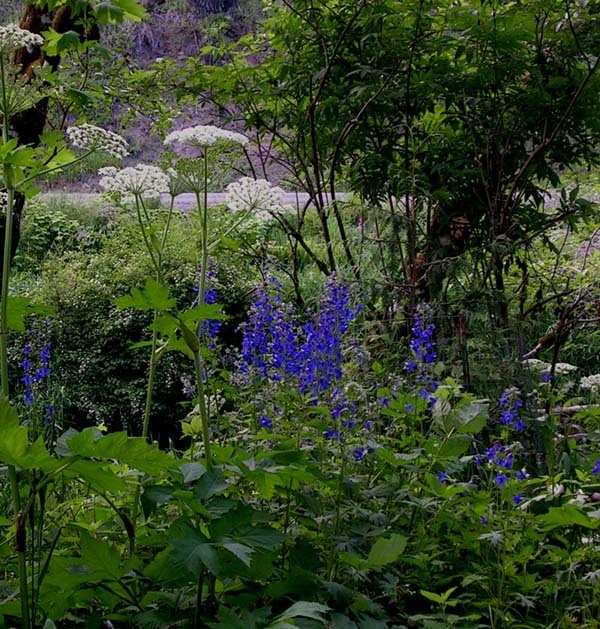 The bright blue flowers are larkspur, on stems about 3 feet (1 meter) tall. The white flowers that look a little like Queen Anne’s Lace are really something called cow parsnip. The foliage is very different from QAL, as you can see. This combination stretches for about 1/4 mile along the river near us. 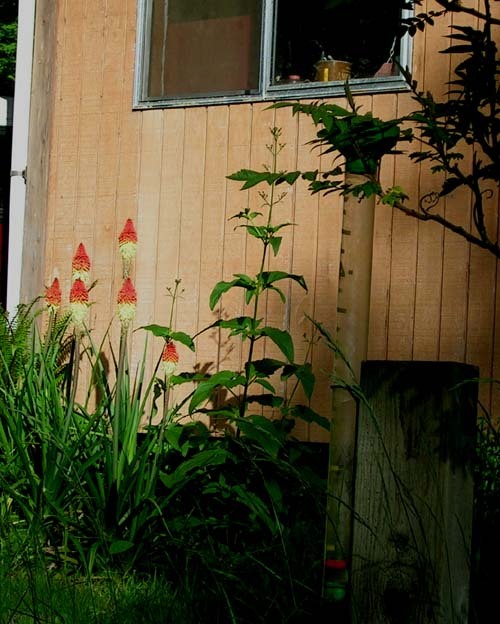 The building in this picture is Ben’s workshop. The orange/light yellow flowers are “red hot poker.” The orioles love this plant, which is why I was hoping the strange bird I saw the other day was an oriole. The tall spindly stuff next to the pokers is horseradish. The branch you can see just above the rain gauge (I’m glad I took this picture, I didn’t realize the tree is growing over the rain gauge) is a sumac, just unfolding now, that turns neon orange in the fall. That’s it for tonight. . .